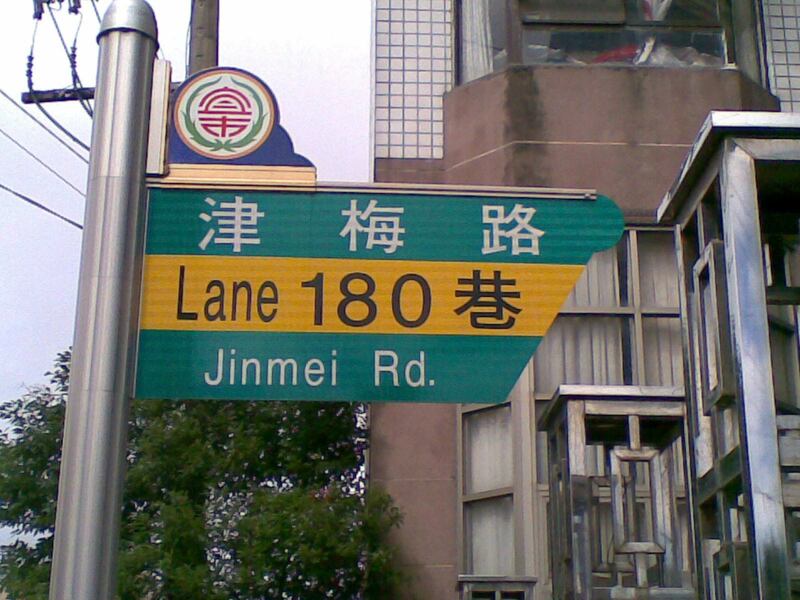 Reader Jens Finke recently came across a newspaper clipping from about twenty years ago, the dark ages of Taipei’s street signs. Back then most roads in the city were identified in bastardized Wade-Giles and wildly misspelled variations thereof. Two or even more spellings for one name at the same intersection was not uncommon. (Outside of Taipei, many signs were in MPS2, which is often mistaken — including in the article below — for the Yale system.) And so the foreign community of Taiwan by and large cried out for the use of Hanyu Pinyin. But that’s not what foreigners got. 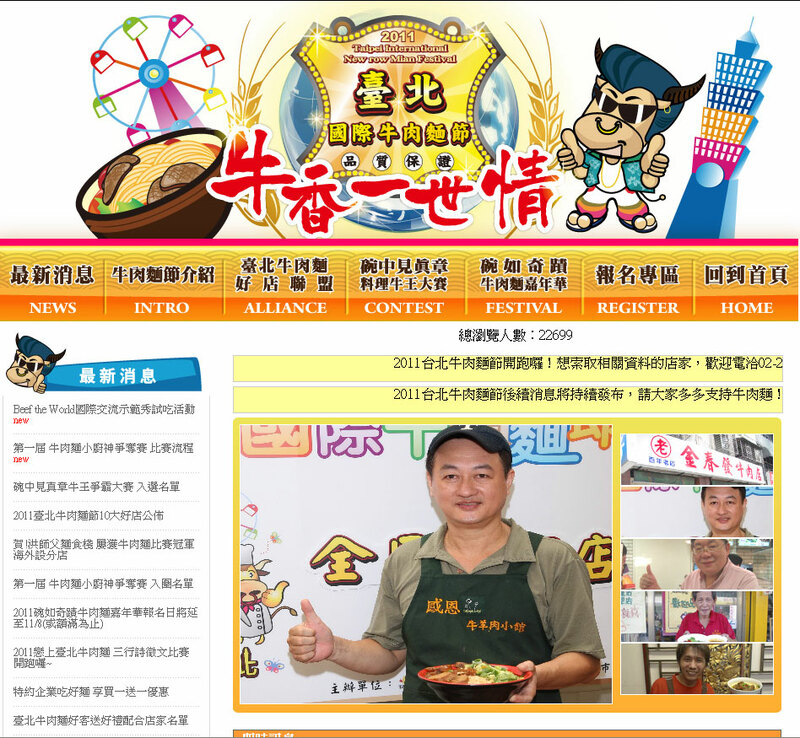 Instead, Taipei Mayor Chen Shui-bian decided to go with a half-baked local invention called Tongyong Pinyin. Really, half-baked. Incredibly, not long after street signs started to go up in this system in 1998, its creator changed it. For example, the article mentions “Zhongsiao” (“Zhongxiao” in Hanyu Pinyin). 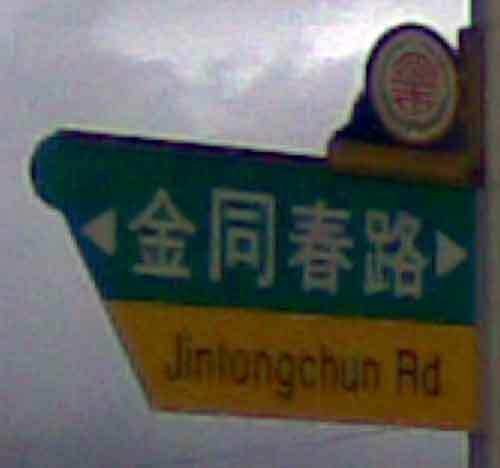 Scarcely had the paint dried on the new street signs than the spelling in the supposedly same system was changed to “Jhongsiao.” This and other changes rendered most of the new signs obsolete. But before many signs went up in the old new system or the new new system, Chen lost his December 1998 reelection bid. His successor, Ma Ying-jeou, didn’t pursue Tongyong Pinyin. Ma even took the surprising step of asking foreigners what they wanted and took action to implement the overwhelming choice of the foreign community (both then and now): Hanyu Pinyin, though unfortunately the road to this was not without monumentally foolish detours, bad ideas, and still-unfixed errors. In 2000, Chen was elected president. 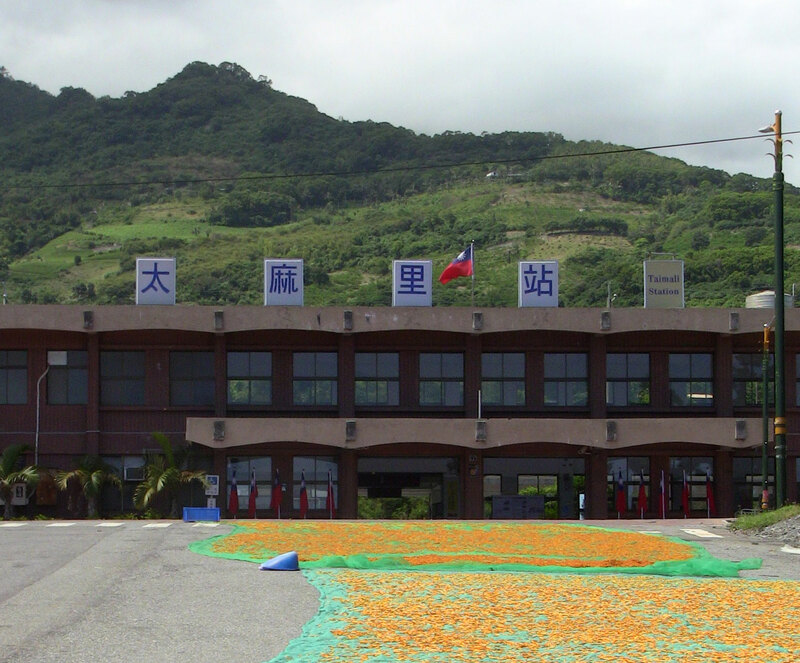 He asked his minister of education, Ovid Tzeng, to decide on a romanization system for Taiwan. After Tzeng picked Hanyu Pinyin, he was given the boot. His successor saw the writing on the wall and quickly announced his support of Tongyong Pinyin. Meanwhile, Ma, who remained mayor of Taipei, said he had no plan to change to Tongyong Pinyin. This time marks the beginning of Taiwan’s romanization wars, which raged in the first decade of the century and have still not been completely resolved. 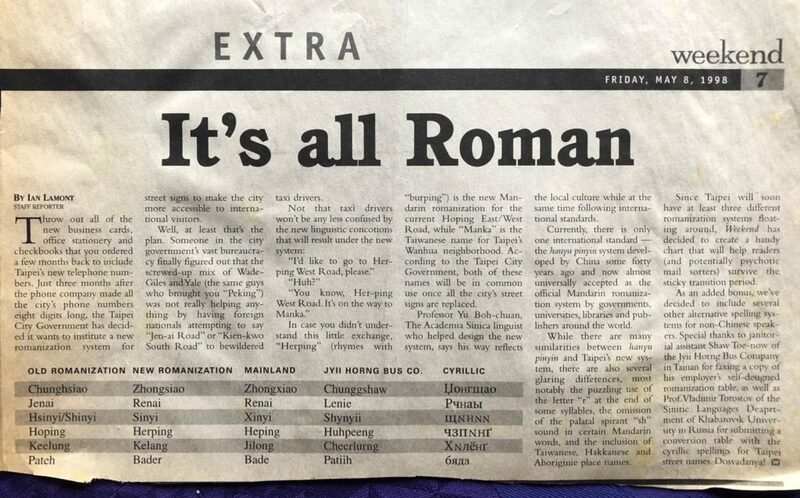 Some readers may suspect the reporter in the article below of pulling people’s legs (e.g., “Special thanks to janitorial assistant Shaw Toe-now of the Jyii Horng Bus Company in Tainan for faxing a copy of his employer’s self-designed romanization table”). But I assure you, it would be very difficult to outdo the craziness of Taiwan’s romanization situation back in those days. 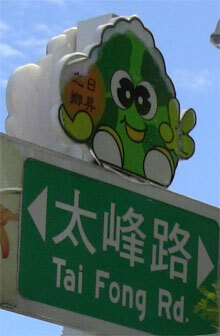 Feel free to use the comments section below if you’d like to share any recollections of Taiwan’s signage mess of the 1990s and before. In my transcription, I’ve fixed a few typos and omitted the article’s Cyrillic system for Mandarin. Throw out all of the new business cards, office stationery and checkbooks that you ordered a few months back to include Taipei’s new telephone numbers. 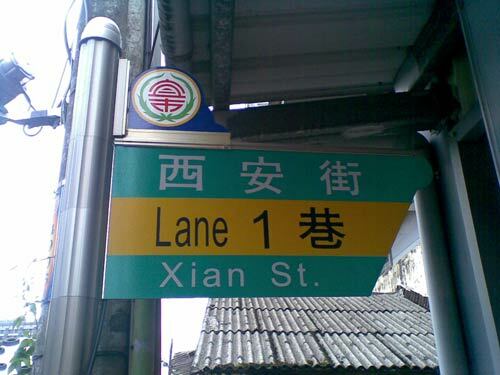 Just three months after the phone company made all the city’s phone numbers eight digits long, the Taipei City Government has decided it wants to institute a new romanization system for street signs to make the city more accessible to international visitors. Well, at least that’s the plan. Someone in the city government’s vast bureaucracy finally figured out that the screwed-up mix of Wade-Giles and Yale (the same guys who brought you “Peking”) was not really helping anything by having foreign nationals attempting to say “Jen-ai Road” or “Kien-kwo South Road” to bewildered taxi drivers. In case you didn’t understand this little exchange, “Herping” (rhymes with “burping”) is the new Mandarin romanization for the current Hoping East/West Road, while “Manka” is the Taiwanese name for Taipei’s Wanhua neighborhood. 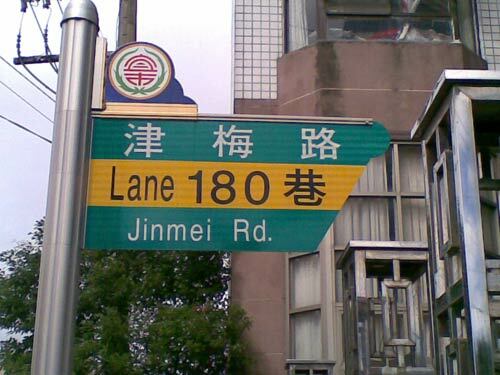 According to the Taipei City Government, both of these names will be in common use once all the city’s street signs are replaced. Professor Yu Boh-chuan, the Academia Sinica linguist who helped design the new system, says his way reflects the local culture while at the same time following international standards. Currently, there is only one international standard — the hanyu pinyin system developed by China some forty years ago and now almost universally accepted as the official Mandarin romanization system by governments, universities, libraries and publishers around the world. 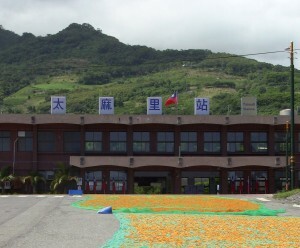 While there are many similarities between hanyu pinyin and Taipei’s new system, there are also several glaring differences, most notably the puzzling use of the letter “r” at the end of some syllables, the omission of the palatal spirant “sh” sound in certain Mandarin words, and the inclusion of Taiwanese, Hakkanese and Aborigine place names. Since Taipei will soon have at least three different romanization systems floating around, Weekend has decided to create a handy chart that will help readers (and potentially psychotic mail sorters) survive the sticky transition period. As an added bonus, we’ve decided to include several other alternative spelling systems for non-Chinese speakers. Special thanks to janitorial assistant Shaw Toe-now of the Jyii Horng Bus Company in Tainan for faxing a copy of his employer’s self-designed romanization table, as well as Prof. Vladimir Torostov of the Sinitic Languages Department of Khabarovsk University in Russia for submitting a conversion table with the cyrillic spellings for Taipei street names. Dosvidanya! “But maybe he doesn’t understand numbers,” said Milo, who found it a little difficult to read himself. 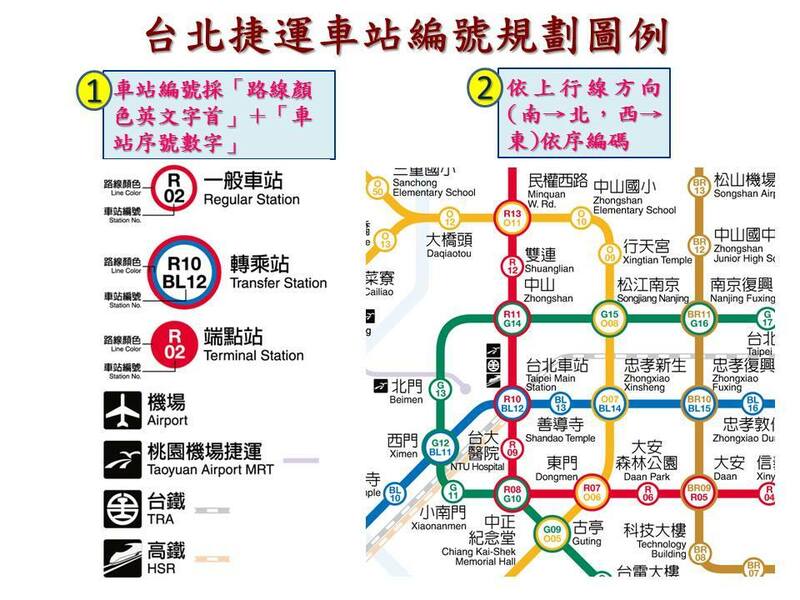 The Taipei MRT system has announced that it may be adopting a nicknumbering system for stations within the system. I have, however, been complaining for many years about mistakes in the names of some MRT stations and how the MRT system has chosen some bad names. To no avail. But when a politician with no particular history that I’ve seen of giving a damn about what foreigners in Taiwan want decides to grandstand his half-cocked notion, the authorities behind the MRT system jump to implement it, no matter what the supposed beneficiaries might want. Shame on them. Indeed, this particular politician’s history is of opposition to what foreigners want in terms of signage, as shown by his partisan remarks in favor of Tongyong Pinyin (which is widely despised by Taiwan’s foreign population) and against Hanyu Pinyin (which is almost universally preferred). So I see ample reason to question his motives here. This new nicknumbering system, by which MRT stations will be assigned additional names (e.g., “R13” and “O11”, for one particular station) is being touted as something aimed at helping foreigners. But I know of no foreigners who have needed any great help on the MRT system — at least not since the city finally implemented Hanyu Pinyin many years ago. Certainly there has been no great outcry from foreigners for any change of this sort. Instead, the nicknumbering system is simply a bad idea that will make things worse, not better. And it will be expensive to implement — money down the drain. 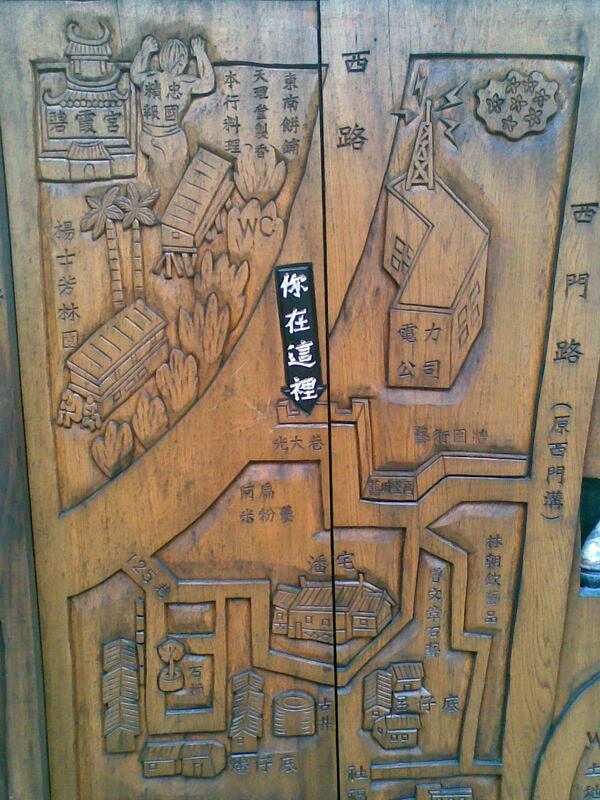 Let’s look at the fragment of the nicknumbering map that the Taipei City Government included with its post. Try to ignore the horrific clutter for the moment. Note the red line (which also has a line number … that no one uses except for the MRT system itself in its announcements, something implemented in the previous bad idea from the MRT system). Anyway, along the red line, Da’an Park (which the MRT system wrongly labels “Daan Park”) is nicknumbered “R06,” Da’an as R05, and Xinyi Anhe as R04. That would make Taipei 101 / World Trade Center station R03; and Xiangshan, which is presently the terminus, would be R02. The problem here is that at least two more stations are already planned for that end of the line: Songde (松德) and Zhongpo (中坡); that would mean the final(?) station would need to be oddly nicknumbered R00, though there are no other zero stations given elsewhere. And if any stations are added after that, either the whole system would need to be renumbered or the numbers would need to head into negatives. Absurd! Such is likely also the case with other lines. This is the sort of thing that strongly indicates that the authorities haven’t really thought this through. They’re just going forward anyway, which is foolish. For that matter, why are there zeros marked in the numbers below ten? (For example, why “R04” rather than “R4”?) Putting zeroes next to the capital letter O (for the orange line) is certainly not going to help clarity either. For example, are people going to get “O05” right at a glance? I doubt it. Let’s get back to the matter of clutter. This is a real problem. The more information crammed into a map, the less clear the individual elements are. And unlike distinct station names, nicknumbers are not easy to remember. If any foreign tourist asks someone how to get to BL13, for example, people likely won’t know how to answer them. Nicknumbering is thus the opposite of helpful, which is likely part of why almost no subway system in the world uses this, other than Tokyo, whose system is much larger than Taipei’s. Also, I can’t help but wonder how they are planning on handling this in the announcements within the cars. Those announcements are in four languages (Mandarin, Taiwanese, Hakka, and English), which takes some time to get through. Adding nicknumbers in all of those languages is going to make for never-ending talking on the announcement system — and that’s without even figuring in the nicknumbers of transfer stations as well. The last time the city of Taipei implemented nicknumbering for anything, this was met with near-universal derision from those it was supposedly designed to help. 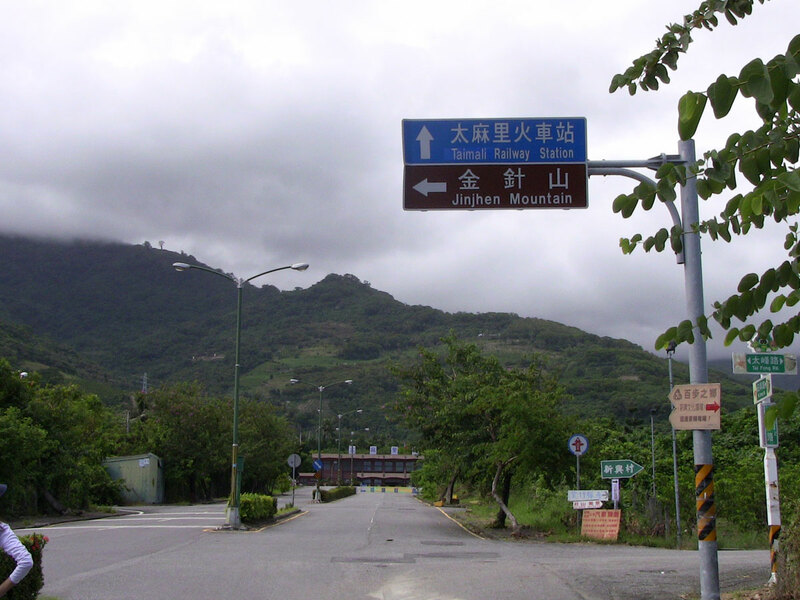 Most people in Taiwan’s foreign community quickly recognized it was a terrible idea — really, really terrible — which unfortunately didn’t stop Taipei from cluttering up the city’s signage with largely useless information. I would have thought that the city would have learned its lesson by now. This photo from 2000 shows an almost perfect storm of bad ideas supposedly meant to help foreigners. 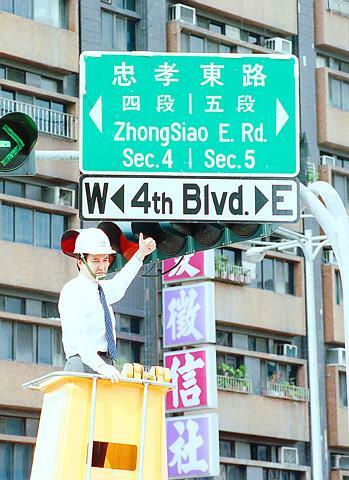 Ma Ying-jeou, during his days as mayor of Taipei, gives a thumbs-up to a road sign with his new nicknumbering system. 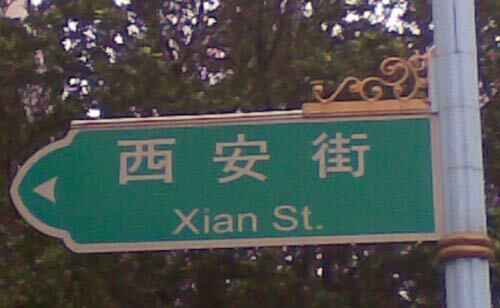 And above the sign for 4th Blvd is a street sign from Chen Shui-bian’s tenure as mayor. 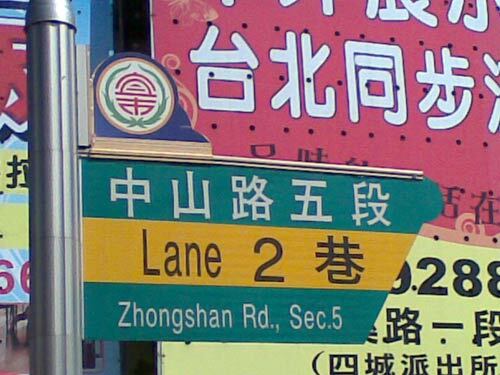 It’s in the much-hated Tongyong Pinyin romanization system — or what was Tongyong Pinyin until the designers of Tongyong Pinyin changed the system (e.g., zh –> jh) and made a lot of their own signs wrong. And to top it off, it employs InTerCaPiTaLiZaTion, another annoying bad idea that still infects the street signs of Taipei. Here, Taipei City Government officials, is what most foreigners need and want: correct Hanyu Pinyin. For the most part, that’s what the MRT system already has. Don’t screw it up. Here are some signs in Yilan, which is in northeastern Taiwan. As the examples below demonstrate, Yilan uses Hanyu Pinyin on its street signs. 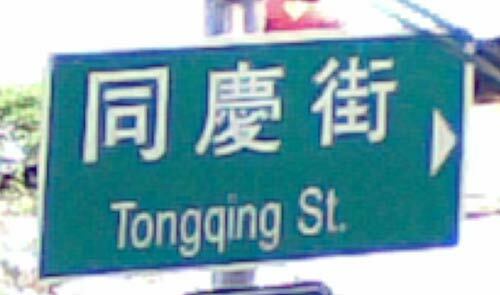 I saw only one old street sign in Tongyong Pinyin; this was through the window of a bus in motion, so I wasn’t able to get a photo. It seems that Yilan has problems with apostrophes as well. These should, of course, read Xi’an. 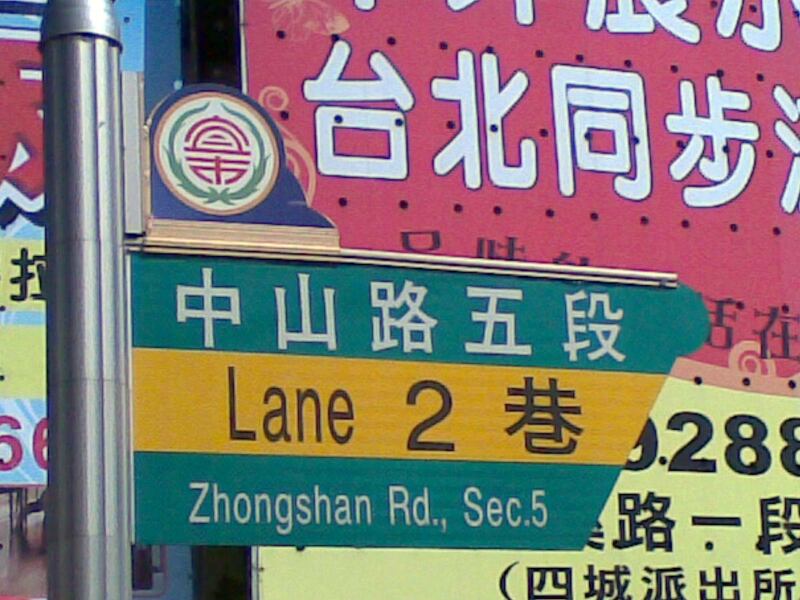 In Taiwan, the vast majority of street names are two syllables long. Here’s a rare three-syllable name. I was told that the name comes from the company that constructed the irrigation channel parallel to the road. The sign — and even the name itself — is so new that it’s not in the current version of Google maps. Note the use of “WC”. I don’t care much for Yilan’s rainy weather; but the city does have style. 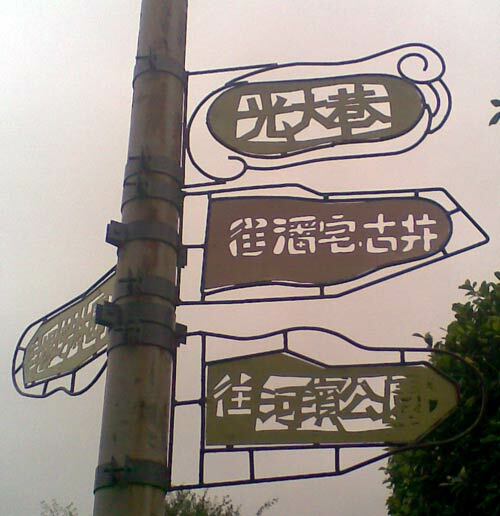 These signs, for example, are interesting — much more so than a failed attempt at a decorative sign in Tongyong Pinyin in Banqiao. The highway signs in Yilan, however, are in Tongyong Pinyin. 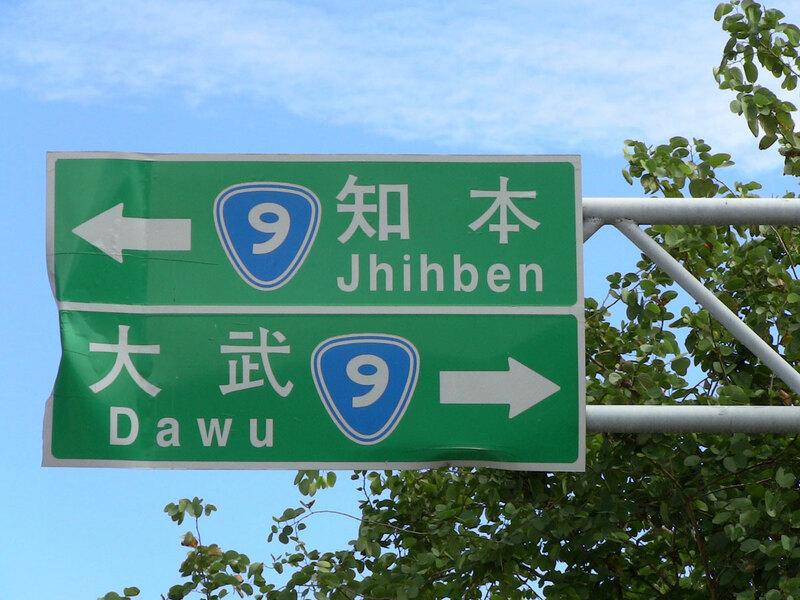 This is a somewhat odd situation, given that highway signs belong to the national government, which is under the control of the KMT, which supports Hanyu Pinyin. Yilan is back in the DPP camp. (The Democratic Progressive Party continues to oppose Hanyu Pinyin and support Tongyong Pinyin.) 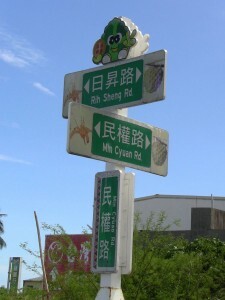 The switch of streets signs to Hanyu Pinyin was probably done under the previous magistrate, who was a member of the KMT. I’m including this one despite the poor image quality because I want to note the awful typography (e.g., uneven baselines, capital letters too large). 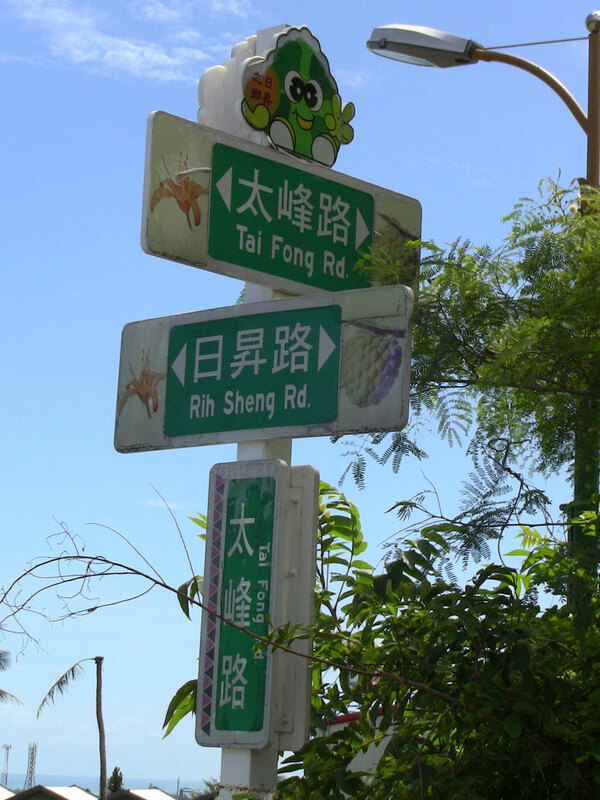 Here are some signs in Taimali Taimali (Tàimálǐ / 太麻里), Taidong County, Taiwan. In all cases of distinctive spellings, they’re in Tongyong Pinyin, even though they should have been replaced by Hanyu Pinyin years ago. 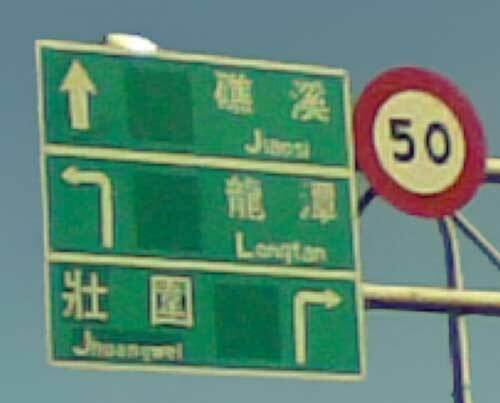 When the change to Tongyong Pinyin was implemented, however, signs under national control (e.g., highway signs) were switched relatively quickly throughout the country. This, however, has not been the case with the switch to Hanyu Pinyin, especially in the south. 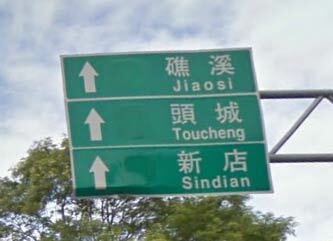 The maps of Taiwan put out by GooGle are plagued with errors in their use of Pinyin. But what about that other big company with deep pockets? You know: Microsoft. How good a job does Microsoft’s Bing do with its maps of Taiwan? I won’t keep y’all waiting: After examining Bing’s maps of Taiwan the two words that came first to mind were incompetent and atrocious. The country-level map is odd, offering Wade-Giles. And although the use of the hyphen is irregular, I will give Bing points for getting at least Wade-Giles’ apostrophes right. So, although some place names on the map are decades out of date (e.g., Hsin-chuang, Chungli, Chunan, Kuang-fu), at least they’re not horribly misspelled within that system. It’s at the street level that Bing’s weirdness becomes most apparent. 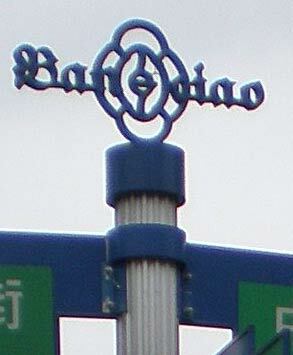 For example, below is part of Bing’s map of Banqiao. Wen Hua could be either MPS2 or Hanyu Pinyin, but not Tongyong Pinyin. And it should be Wenhua. Banchiao is just wrong, regardless of the system. They were probably going for MPS2 but erroneously used an o instead of a u: Banchiau. Sec 1 Rd should be Rd Sec. 1. So that’s four systems, plus additional errors. There’s much, much more that’s wrong with this than is right. That’s even more evident on a larger map — and that’s without me bothering to mark orthographic problems in the Pinyin (e.g., Wen Hua instead of the correct Wenhua). Here bastardized Wade-Giles (e.g., “Mrt-Hsinpu” at top, center — and, FWIW, in the wrong location) has been added to the mix, making a total of five different romanization systems, as well as some weird spellings, e.g., U Nung, Win De, Bah De, Ying Sh — and that’s without including my favorite, JRLE, because that one is correct in MPS2 (“Zhile” in Hanyu Pinyin). The main point is that vast majority of names are spelled wrong. And among the few that are spelled correctly, those that are written with correct orthography can be counted on one hand. So, to the words above (incompetent and atrocious) let me add FUBAR. The copyright statement lists not only Microsoft but also Navteq. The Taiwan maps on the latter company’s site, however, are different from those on Bing. Navteq’s are generally in Hanyu Pinyin, though almost invariably improperly written (e.g., Tai bei Shi, Ban Qiao Shi). And despite the prevalence of Hanyu Pinyin, they still contain other romanization systems (e.g., Jhong Shan) and outright errors (e.g., Shin Jahn). So an update from Navteq wouldn’t be nearly enough to fix Bing’s problems, which are fundamental.